Josh Chisum of California caught his first tarpon — estimated at about 140 pounds — on a pass crab. He was guided May 7 by Capt. Warren Girle. 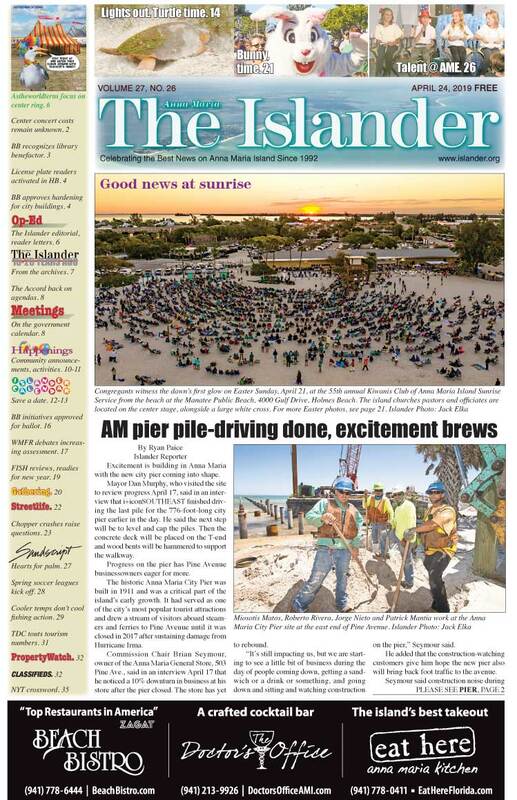 With the recent arrival of tarpon, I’d say the plate is now full for anglers visiting and fishing around Anna Maria Island. The smell of tarpon is in the air. It’s time to dust off your tarpon tackle and make sure everything is in working order. There is no fish in our waters that is harder on tackle than the silver king — so make sure you’re covered. 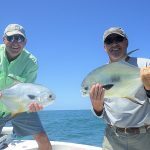 Other fishing around Anna Maria is as follows. Inshore, spotted seatrout are a mainstay. Stunning numbers of fish over 20 inches are being caught with live bait. Don’t forget, you want to return these big females back to the water in good shape so they can procreate. Plus, the big trout aren’t as tasty as the smaller ones. Catch-and-release snook fishing is proving to be a hot topic for anglers. This is the time of year to find snook cruising the shoreline along the Gulf beaches. And that means sight-casting. There is not a more exciting way to target these fish. Plus, you have opportunities to cast at some big fish — 40-plus inches. Come to think of it, while you’re working the beach, don’t forget to bring a pompano jig. These elusive little gold nuggets can be found cruising up and down the shoreline foraging on sand fleas and coquinas. If the snook aren’t cooperating — and they’re catch and release — you’ll have to suffer with pompano in the fry pan — oh darn. 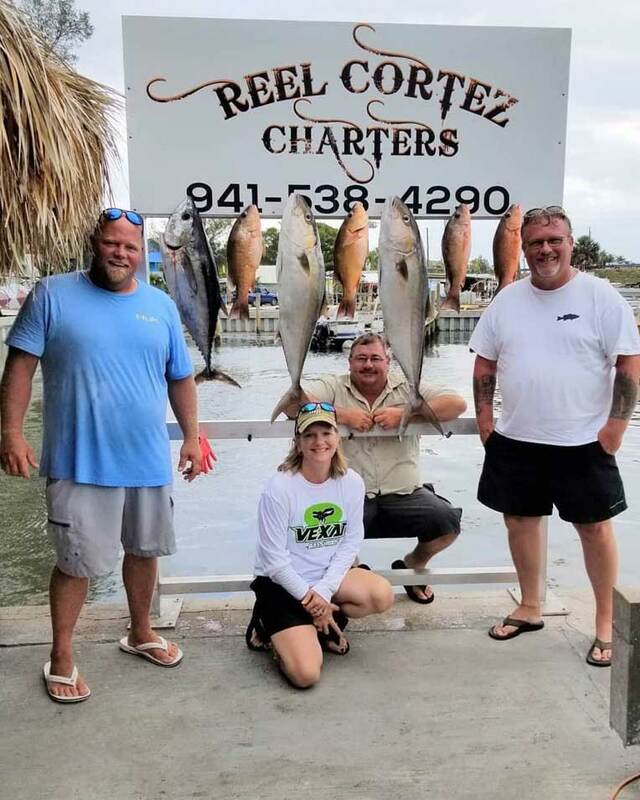 Fishing offshore at the wrecks and reefs is providing good action on a variety of fish — permit, Spanish macks, amberjack, blackfin tuna and bonito. Catch all in one day and you’ve earned your stripes. On my fishing excursions with Southernaire charters, I’m concentrating on catching big trout in Sarasota Bay. The largest so far is 28 inches but I’m looking for a 30-incher. Most trout are in the slot of 15-20 inches. While targeting the trout, I’m also finding bluefish, mackerel and jack crevalle. Catch-and-release snook fishing is providing plenty of sport for my clients. Fishing the flats is resulting in some good fish, but fishing the beaches and passes is proving to be even better. Lastly, fishing around the artificial reefs is resulting in mangrove snapper and many Spanish mackerel. Both are being caught on live shiners. Large barracuda also are present, which adds some variety to the action. Capt. Warren Girle says he’s fishing a month-of-May pattern. Translation: tarpon. To target these elusive silver torpedoes, Girle is casting live crabs into schooling fish. Free-lined crabs combined with a 60-pound fluorocarbon leader and a 6/0 circle hook is getting the job done. Most catches are 60-100 pounds, with bigger fish mixed in. 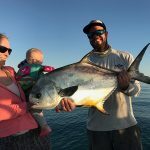 Reef fishing offshore also is producing action for Girle’s clients. Numerous kingfish are being caught by free-lining large shiners around reefs and wrecks. Bottom fishing in these same areas is resulting in mangrove snapper and juvenile grouper. Capt. Aaron Lowman is spending most of his days hovering around the offshore reefs and wrecks. Due to the vast amounts of bait in these areas, numerous predatory fish are present and conditions are ripe. Kingfish, mackerel, cobia and bonito can be found during morning excursions out to the reefs. Mangrove snapper and gag grouper are taking the hook, too. Shark encounters are frequent for Lowman while patrolling around the reefs and wrecks. Most commonly seen are blacktip and spinner sharks, plus an occasional tiger shark. When not fishing in the Gulf of Mexico, Lowman is targeting spotted seatrout throughout the flats of Sarasota Bay. Numerous slot and just-under slot fish are being caught. Jim Malfese at the Rod & Reel Pier is seeing a variety of species being reeled up to the deck. The return of Spanish mackerel is a welcome sight, although these fish are only present when large schools of bait fish surround the pier. Flounder, black drum and redfish also are being caught with regularity. Casting live shrimp under the pier is the key to success for these fish. Lastly, large snook can be seen cruising in the shadow under the pier. Large baits, such as pinfish or ladyfish, are the baits of choice. Capt. Rick Gross of Fishy Business Charters — there’s a name we haven’t heard in a while. After a brief hiatus to enjoy his newborn granddaughter, Gross is back on the water with a purpose. And that purpose is to catch fish. According to Gross, spotted seatrout are the go-to species for those who want to catch a fish dinner. Patches of grass in 3-6 feet of water is where Gross is finding the most fish. Although many of the trout being caught are in the 14-inch range — just an inch shy of the size limit — Gross is managing to put limits of slot-size fish in the cooler for his clients. Catch-and-release snook fishing is proving good for Gross. Numerous fish — 22-26 inches — and a nice slot-size fish every so often are taking the bait. Lastly, Gross says tarpon should really fire off with the new moon in June. Capt. 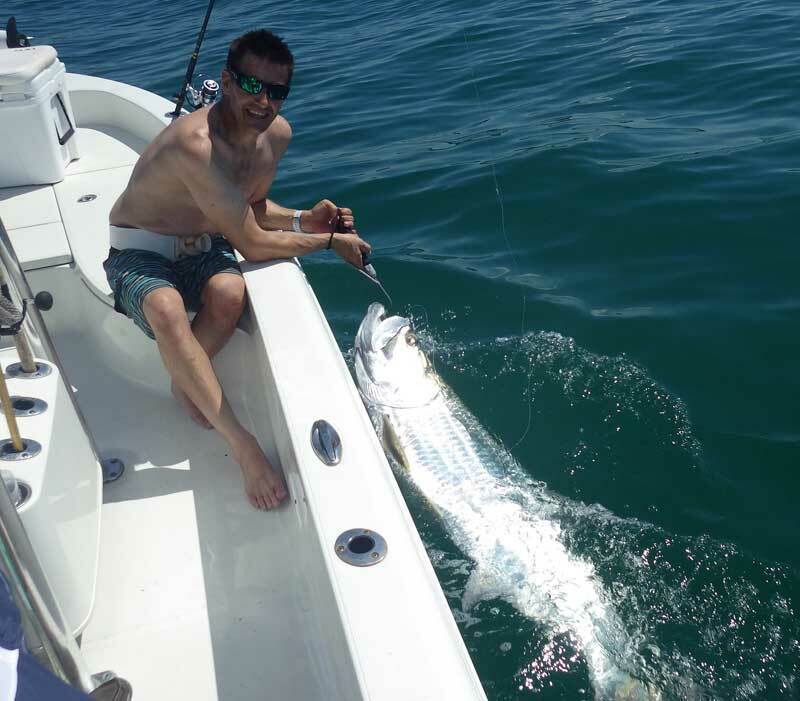 David White of Anna Maria Charters is targeting tarpon on the fly. Hookups are occurring on flies like “tarpon bunnies” and eel patterns. White says he’s impressed with the number of kingfish being caught offshore and Spanish mackerel are present in the same areas. Also, mangrove snapper are being caught with regularity on the artificial reefs. Capt. Jason Stock is on patrol offshore, with good results. He reports permit are hooking up on live crabs around offshore reefs and wrecks. Amberjack and blackfin tuna also are on the menu, attracted to both artificials and live bait. The same applies for kings and Stock says slow-trolled bait is getting the job done.